Super Savings Item! Save 32% on the Blue Emu Maximum Arthritis Pain Relief Cream, 3 Ounce by Blue Emu at HQ Health Blogs. MPN: 00919. Hurry! Limited time offer. Offer valid only while supplies last. Blue-Emu Maximum Arthritis Pain Relief is an Odor Free pain relief cream that combines the active ingredient, Trolamine Salicylate, with Emu Oil. 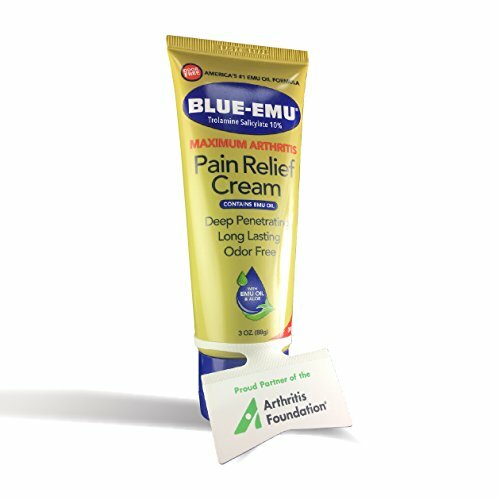 Blue-Emu Maximum Arthritis Pain Relief is an Odor Free pain relief cream that combines the active ingredient, Trolamine Salicylate, with Emu Oil. This unique formula provides relief of minor aches and pains of muscles, and joints associated with minor arthritis, strains, sprains, bruises, and backaches. Works fast for quick relief from pain. View More In Pain Relievers. If you have any questions about this product by Blue Emu, contact us by completing and submitting the form below. If you are looking for a specif part number, please include it with your message.